The General Assembly will reconvene on July 13, 2015. At that time, a committee comprised of members of the House and Senate will work on a biennial budget that will ultimately be passed by a majority in each chamber. Because this did not occur before the last day of the fiscal year, the House and Senate passed 2015 Continuing Budget Authority, “an act authorizing the director of the budget to continue expenditures for the operation of government at the level in effect on June 30, 2015.” The continuation budget provides additional funds to accommodate the expected growth in public school student enrollment, but keeps all other education expenditures flat. The continuation budget remains in effect through August 14, 2015, at 11:59 PM. On August 12, 2015, Senate Bill 560 was ratified. The bill authorizes the Director of the Budget to continue expenditures for the operation of government at the level in effect on June 30, 2015, until August 31, 2015. On August 18, 2015, the Governor and General Assembly leaders agreed on a total spending amount for the 2015-17 budget. That amount, $21.735 billion, is a 3.1 percent increase over the current budget, $415 million less than the House proposed budget and $265 million more than the Senate proposed budget. On August 28, 2015, Session Law 2015-233 was passed. The bill authorizes the Director of the Budget to continue expenditures for the operation of government at the level in effect on June 30, 2015, until September 18, 2015. Read our fact sheet, The Impact of the 2013-15 State Budget or our quick facts for additional information and links to other budget resources. Confused about some of the budget terminology? Learn about the budget process and access a glossary of budget terms from the NC Office of Budget and Management. The passage of the 2013-15 state budget dealt a powerful and immediate blow to North Carolina’s public schools. While North Carolina’s student population has grown by 43,739 students since 2008-09, funding has remained flat. Teacher Pay 25th in U.S. 46th in U.S.
*In the 2013 legislative session, the General Assembly voted to end teacher career status. A June 2015 ruling from the NC Appeals Court that ending teacher career status for educators who have already earned that status was unconstitutional. Career status protects teachers from being fired arbitrarily (without due process). Teachers who have yet to earn career status are effectively temporary employees and are given only one-year contracts. Beginning in 2016, teachers without career status can be offered one, three or four-year contracts. Allocates $275M in recurring funds for an average 5.5% teacher pay raise. In some cases, longevity pay, which rewarded teachers with 10+ years of service with a bonus was eliminated, and used to fund pay increases. Caps annual teacher salaries at $50,000. A certified teacher with a bachelor’s degree would earn $50,000 at 25 years of service. The U.S. average public school teacher salary for 2012—13 was $56,103. Eliminated 5,184.5 teachers and 272 support personnel (guidance counselors, psychologists, social workers, etc.) in 2013-14. Additional cuts are anticipated in 2014-15. Cuts 3,300 teacher assistant positions in 2014-15, in addition to the 3,850 positions cut last year. 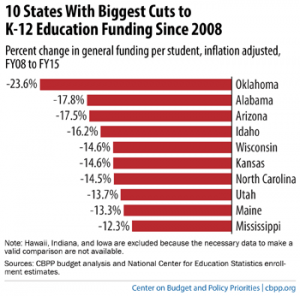 Another significant change in K-12 education funding was passed in the 2014 legislative session. Historically, school districts were provided with “planning allotments” at the beginning of the school year that accounted for a district’s in average daily membership (ADM). A new budget provision eliminates these up-front dollars used to fund additional staff and other resources needed to accommodate student population growth. School districts that do not have a fund balance (“rainy day” account) will be forced to make cuts to their current operating budget to cover costs. Moreover, school districts will not know until the following fiscal year whether their enrollment growth will actually be funded. Read more. The Center on Budget and Policy Priorities October 2014 report, “Most States Funding Schools Less Than Before the Recession” shows that North Carolina ranks 7 among 14 states in which 2014-15 per-pupil funding is more than 10 percent lower than in 2008 when the recession hit. Adjusted for inflation, North Carolina is spending $855 less per student this year than in 2008.